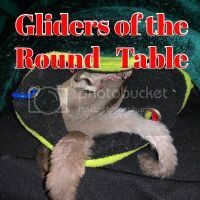 I have had my sugar gliders for 2 years and have not heard this specific sound before. Is it normal? Do you know what the glider is 'doing' when making this sound? It would help to know what they were doing. Or where they were. She was just in her pouch with her glider buddy. Mine occasionally makes sounds exactly that when sleeping. If I manage to peek in without disturbing them (very hard to do), it looks like they're dreaming (eyes closed, no reaction, twitching when making the sounds). Doesn't happen often at all with my four. It's just a guess from my experience. I had a feeling this is what was happening but wanted to make sure. More than likely as Hutch stated one of them didn't like where the other was positioned or had a foot in their side or somewhere else. It is perfectly normal. I agree with the above. Mine bark, crab, cry, and churp in their dreams. I have one separate from the other two right now and she dreams a lot. When I check on her, she looks at me like"What?" There is prime real estate in the pouch. They may be trying to claim it. The bottom of the pile is the sweet spot.